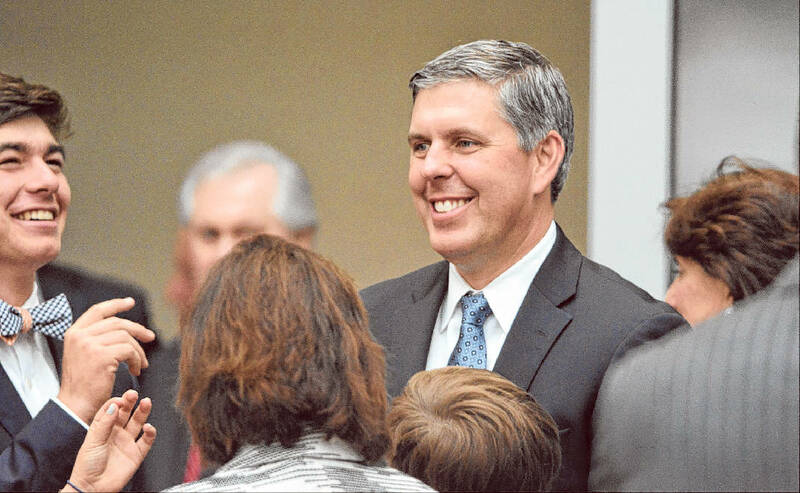 President Rick McKenney is photographed after the annual shareholder meeting at Unum on Thursday in Chattanooga where he was introduced to shareholders as the successor to outgoing CEO Tom Watjen. Unum Group has a new CEO, but Richard "Rick" McKenney isn't new to the Chattanooga-based company. McKenney on Thursday assumed the role of top executive during the insurer's annual shareholder meeting. Tom Watjen, who held the post for more than a dozen years, retired Thursday, though not from Unum altogether. Watjen, 60, will serve as chairman of the board of directors for the next two years. "For me to be able to pick up the phone and talk to Tom and leverage that expertise ... it's good that Tom is staying on," McKenney, 46, said after the meeting. McKenney, a Tufts University graduate, joined Unum in 2009 after working as CFO of Sun Life Financial and Genworth Financial. Unum Group on Thursday increased by 12 percent the quarterly dividend it pays on its common stock. The new rate of 18.5 cents per share, about 74 cents per share annually, will be effective with the dividend paid in the third quarter of this year. This is the seventh consecutive year the company has increased its dividend. The new rate represents a 147 percent increase from 7.5 cents per share in 2007. 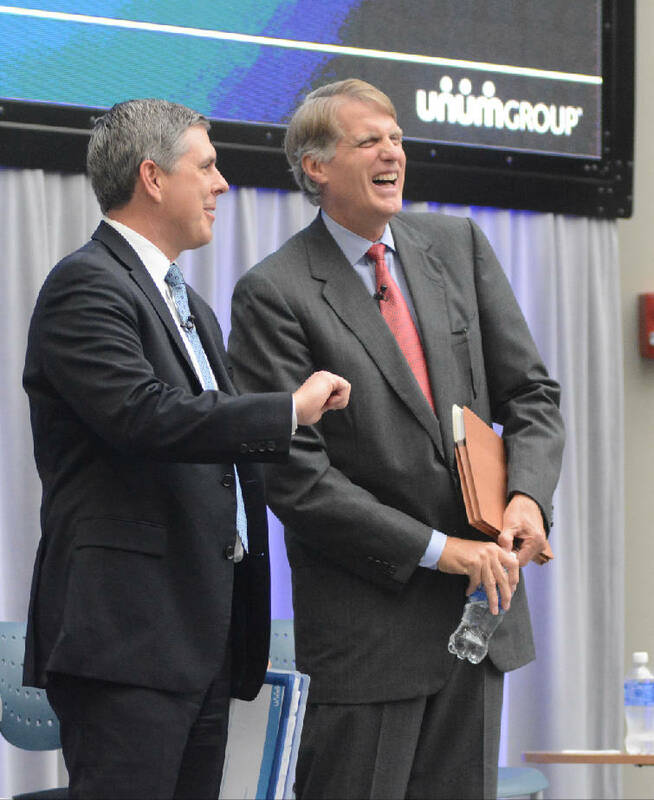 Outgoing CEO Tom Watjen, right, and his successor, president Rick McKenney, chat after the annual shareholder meeting at Unum on Thursday in Chattanooga. He presented a largely optimistic picture during his first speech as CEO, one that noted the company provided $6.7 billion in benefits in 2014. "We have to start first with our customers," McKenney said. "We've also been able to deliver to shareholders." The company's earnings have grown 5.5 percent a year since 2008, "through a pretty tumultuous time," he said. The company's board of directors on Thursday voted to increase by 12 percent the quarterly dividend Unum pays on its common stock. The new quarterly rate of 18.5 cents per share, or 74 cents per share annually, will be effective with the dividend paid in the third quarter of this year. Unum's stock dropped by a penny per share in trading Thursday in the New York Stock Exchange to close at $34.95. Unum stock has risen by more than 12 percent since the end of January and has more than tripled from a low it reached in 2003, when Watjen came on board. Still, Unum shares remain well below their 1999 peak, when they traded above $60. The board also authorized the repurchase of up to $750 million of the company's outstanding common stock through Nov. 21, 2016. The company has repurchased about $2.9 billion of its stock since 2007, reducing the number of shares it has outstanding by more than a third. Buying back stock is not the most ideal use of capital for Unum, but doing so has been wise, all things considered, McKenney said after the meeting. "You can do a lot of things with capital ... but you have to make sure you are doing the right thing for your shareholders," he said. A dim employment picture in recent years has made it hard for Unum to grow as quickly as company leaders want, McKenney said. "We'd like to grow faster." Unum sells disability, life, accident and critical-illness coverage through the workplace. The improving job market and expanding payrolls should help the company, he said. Unum hasn't seen "the right threshold" for mergers or acquisitions, a priority for use of its capital so that it can expand its footprint, he said. Increasing its dividend is another priority, one it has been able to meet consistently, he said. The hands off to McKenney was planned long in advance of it happening, company officials have said repeatedly. "We knew Tom was going to at some point want to retire from the company," former board chairman William Ryan said Thursday. With Watjen becoming chairman, Ryan was appointed lead independent director for the board. Key to stepping down, Watjen said after the meeting, was doing so when it was good for the business and when a solid succession strategy was in place. "We have a lot of confidence in Rick," said Watjen, who announced his retirement in February. Annual shareholder meetings rotate among Unum locations in the U.S. Last year's meeting was in Portland, Maine.